Welcome back to Field of view, where we take a look back at the week that was both VR and AR. This week we got some hands-on time with Nintendo's Labo VR, which you can chalk up as a more fun Google Cardboard. We also dropped our full review of the cycling-focused Everysight Solos. But that's not all that happened this week. We've rounded up all the latest news and recommendations for you to peruse below. Nintendo has finally returned to VR with Labo VR, and in our hands-on time with it we've found it to be a good time, but Nintendo isn't done just yet. You're not going to just play the mini games provided with the Labo VR kits, you're getting more. Nintendo is updating both Super Mario Odyssey and The Legend of Zelda: Breath of the Wild with VR modes for free. Nintendo's Japanese Twitter account posted some details. 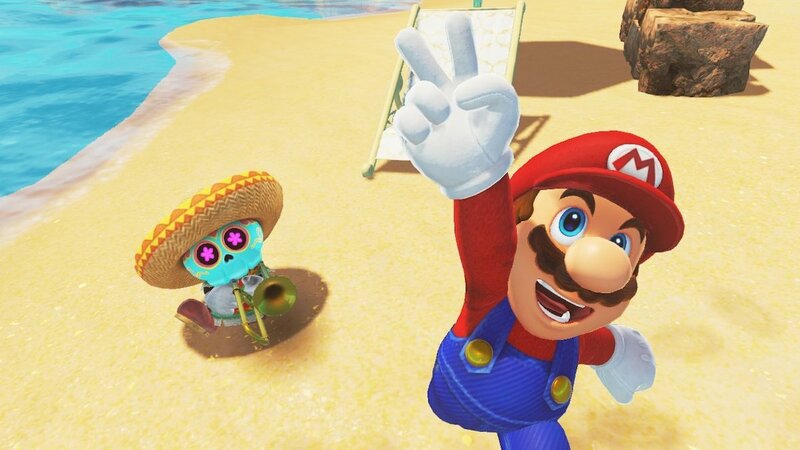 Super Mario Odyssey is getting three VR mini missions where you'll collect coins and music notes. The company hasn't yet revealed what the VR mode for Breath of the Wild will be, but it did also reveal a couple screenshots from the new VR mode for Super Mario Odyssey, which you can see above. Both titles will get the free VR updates on 25 April. PlayStation VR is a big success, selling over 3 million units total. As we barrel towards the inevitable (yet still unannounced) PlayStation 5, it's likely we'll see Sony announce a second PSVR that's more powerful. We've already seen patents for new motion controllers and mixed reality. But its latest patent, found by UploadVR, might be the most interesting. Published on 4 April, the new patent describes a pair of glasses that come with eye-tracking features. Those eye-tracking features would be used for foveated rendering, a technique that concentrates power to improve the graphics in your direct eyesight. The big question here is why. One possibility is that these glasses would be used to bring foveated rendering to existing PSVR headsets, much like you can purchase eye-tracking upgrades for the original HTC Vive. Another is that Sony might release two PSVR models next time around - just like it has two PlayStation 4 versions, the regular and Pro. Perhaps you'd be able to upgrade the lower-end model with these add-on glasses if you choose. Just a theory. But then there's another big question: Would Sony really make people purchase eye-tracking glasses that they had to wear while also wearing a PSVR headset? That seems like it would be a lot, and would add complications to an experience that's already complicated for some people. Either way, Sony's got 'em in the works and we'll have to wait and see when - or if - they ever come to be. Back in February, Apple lost HoloLens co-founder Avi Bar-Zeev, who was heading up its AR headset team. But this week, Apple has hired Jaunt founder Arthur van Hoff as a senior architect for a secret team, reports Variety. We don't exactly know what he's going to be doing, but we can look at his experience. Jaunt was one of the big in cinematic virtual reality, though in recent years it's been developing its own technology. It worked on its own high-end VR cameras and distribution platform. Before van Hoff left Jaunt, he had been steering the company away from VR and toward AR. Apple has also hired many Jaunt engineers. Seeing as how Apple is both working on its own AR headset and iPhones with advanced depth-sensing cameras for phone-based AR, it's likely van Hoff is working on something related to that. Coachella kicks off this weekend, which means a lot of people are about to hit sunny Indio, California. A lot of people are going to need some sunglasses, and Bose is partnering up with the festival to bring its Bose Frames to the party. The Frames, when paired with the Coachella app, will announce reminders performances and other updates. Coachella is also saying they're an easy way to listen to music all day long, as in between performances you'll be able to listen to music on them. Fans can either bring their own Frames or purchase them from merchandising tents at Coachella. This past week, the first image of an actual black hole was released. To celebrate, the European Southern Observatory's Jordy Davelaar and company built a virtual reality simulation of a black hole. It's surrounded by matter that's sucked into the hole. It's a short 360 vid, but it's beautiful all the same. Nintendo's new VR system is out now, and you can purchase it in a number of options. The big one comes with the basic VR headset plus a number of add-ons, but we're going to recommend the more basic option. It comes with just the basic headset and a blaster, but it's not too expensive. Obviously, you're going to need a Nintendo Switch console to use Labo VR.